A documentary about octogenarian fashion photographer Bill Cunningham. A great movie for lovers of fashion, art, photography, history, New York, bikes, and spunky old guys. Bill Cunningham's kindness and joy are infectious even through the screen and his spare, ethical lifestyle, dedicated exclusively to the pursuit of his passion and art, is moving. Although the film doesn’t dig too deeply into the man’s motivations or origins, that seems in keeping with it’s subject who values his privacy and focuses very little on himself. It shows a window of a different, older New York without sentimentality or nostalgia. It is light yet beautiful. Streaming right now in the usual places. Cunningham's NY Times narrated Slideshows which give a taste of his elfin enthusiasm and encyclopedic knowledge of fashion and history. A valentine for Cunningham's quiet, understated activism. Ultimately this is unimportant of course but I am curious if others left this movie with the assumption that he's gay? Also curious how others felt about the approach of the film - not trying to dig too far into his past or private life (for example, the filmmakers didn't follow him to church). I love that last link that you posted, latkes. Saw this last year and loved it. I really like films that show people living with dignity on their own terms. It's a weird analog but I kind of liked "I like killing flies" for the same reason. I loved this movie! His photos are fantastic. latkes, my impression was that he's definitely gay, but that coming out would have been so difficult when he was younger that he just denied himself sexuality entirely. The brief portion of the movie that touched on the subject was heartbreaking. I love this movie completely, and I have watched it at least five times since I learned about it. His life is amazing, and he's almost like a monk of fashion, living in that wonderful, cluttered apartment (until he was kicked out) that held the arts folks from another era. His bicycle! His uniform of a blue smock! His offhand camera style! The question about his sexuality was indeed heartbreaking. He seems to have given up everything except his fascination with fashion. I found that scene moving as well, but it was interesting, the part when he really got quiet was when asked about church. He just put his head down and was silent for what felt like a full minute. It could have meant anything: memories of lost family and childhood? Something about his sexuality? Just embarrassment at discussing something so personal and close to his heart? I love it when a movie wins me over despite my assumption I might not like it. Well, I thought I would find it interesting, but perhaps tedious, and instead it was delightful at almost every moment. I caught this accidentally one day, it started playing after a movie i'd sat down to watch. I enjoyed the meandering tone of the documentary itself, it was nice that it didn't seem to be pushing hard for a solid story to tell. Just sort of wandered around after Bill and popped in to explain who he was and what he was doing. It gave it a nice, open-ended slice of life feel. But mostly what I came away with and enjoyed was how inviting Bill himself was. I got the sense that anyone would be comfortable and feel welcomed around him. I used to be heavily into reading about the couture and high fashion world, and that's emphatically not a personality type that's the norm there. When my daughter was in middle school she got very interested in fashion. And then journalism. 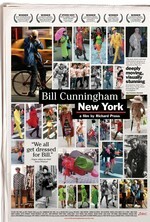 We have a habit of leaving the Bill Cunningham page open on the kitchen table until we've both seen it and discussed. We saw this when it came out at the theater and were blown away since we had no idea of the back story. It is both a well made documentary and a story of an individual who has led an exemplary life. The lack of sexual expression in his life is sad, but I also get the idea that he enjoys his solitude and may have lived a monk like existence whether he could be openly gay or not.